Home › Long-tailed duck › Common goldeneye - Bucephala clangula. The common goldeneye (Bucephala clangula) is a medium sized sea duck belonging to the family Anatidae. 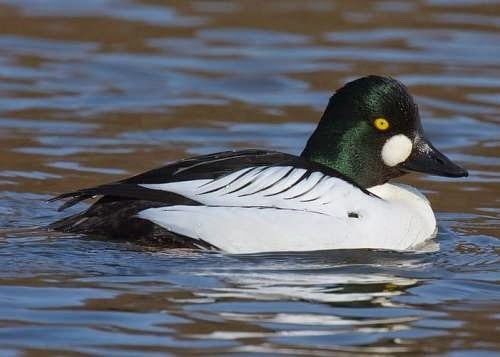 The common goldeneye species is distributed in North America, Europe and Asia. It is a rare visitor to the Indian Subcontinent. Bucephala clangula was previously included in the genus Anas. The common goldeneye species is closely related to Barrow's goldeneye (Bucephala islandica). The two subspecies are: B. c. clangula (Linnaeus, 1758) and B. c. americana (Bonaparte, 1838). The common goldeneye is a medium sized bird and the male measures 40 to 50 cm in length and weighs 900 to 1,400 grams. The female goldeneye is smaller and weighs 500 to 1.100 grams. The wingspan is 65 to 80 cm. The male has a dark head with greenish gloss. The bill and back are black. The neck and belly are white. It has a golden-yellow eye and a circular white patch below the eye. The female goldeneye has a brown head and a greyish body. Their legs and feet are orange. The common goldeneye species inhabit freshwater lakes, ponds, marshes, pools and rivers during breeding. The wintering goldeneye prefers inshore waters, shallow bays, estuaries, tidal creeks and coastal lagoons. The common goldeneye species feed by diving. They feed on aquatic plants, aquatic insects, crustaceans, molluscs, other aquatic invertebrates, amphibians and small fish. The breeding season is during April and May. The goldeneye species usually nest in the hollows in the trees. They also nest in artificial nest boxes. The female incubates the eggs. After one or two weeks into incubation the male abandons the female. The subspecies B. c. clangula breeds in Scandinavia, Central Europe, Russia, North Mongolia and North China. It winters in Britain, Southern Europe, Central Asia, East China, Korea and Japan. The subspecies B. c. americana breeds in Alaska and Newfoundland. It winters in South Newfoundland, North America and Mexico. The southward autumn wintering migration starts from late August. The return migration to breeding sites occurs from February onwards. Certain goldeneye populations in the Europe are found to be sedentary. The global population of the common goldeneye species is estimated to be around 2,500,000 to 4,600,000 individual birds. This species has an extremely large range and there is no conservation concern. The degradation of breeding grounds, pollution and hunting are the major threats. The IUCN (International Union for Conservation of Nature) has categorized and evaluated these goldeneye species and has listed them as of "Least Concern". Current topic in Birds of India: Common goldeneye - Bucephala clangula.